Roy Hodgson says he wants to lead England in the 2018 World Cup qualifiers after being drawn against rivals Scotland. The 67-year-old's current deal runs to the end of the 2016 European Championships in France. "I shall be delighted to retain the position all the time people want me to," Hodgson told BBC Radio 5 live. England are top of their qualifying group for Euro 2016, six points clear of second place with four games left. The side are in a strong position to advance to the tournament next year having won all six games in Group E so far. Former Liverpool and West Brom boss Hodgson took over in 2012, replacing Italian Fabio Capello. Under Hodgson's guidance, England reached the quarter-finals of the last Euros losing to Italy on penalties, before a dismal showing at the 2014 World Cup where they went out at the group stages without winning a game. Despite the poor performance, Hodgson was told by Football Association chairman Greg Dyke in March that contract talks would take place within the next year. 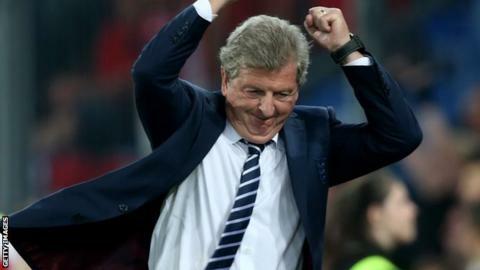 Hodgson wants the opportunity to take the side to the World Cup in Russia in 2018 after being drawn in Group F where they will also face Slovakia, Slovenia, Lithuania and Malta. "It is a great honour and privilege to be England manager - I honestly believe the team we are building has got a chance of doing relatively well in the future," added Hodgson. "Representing England, I am pleased to come away with a good group for the qualifying period and if the FA want me to lead the team I will be delighted to do so. "If we can come through Euro 2016 without too many tears being shed I believe we have a good chance of qualifying for 2018. Maybe FA chairman Greg Dyke's dream of victory at the 2022 World Cup can be brought a bit closer." England and Scotland last met in two friendlies in the 2013-14 season, with Roy Hodgson's side winning 3-2 at Wembley and 3-1 at Celtic Park. Their last competitive meeting was a two-legged play-off for Euro 2000, which England won 2-1 on aggregate. Hodgson added: "The Scotland fixture really does excite people, the recent friendly matches showed that, and we have got recent experience of what the atmosphere will be like. "The games will excite the public, get people in the mass media very excited too, it is a good draw all round - I think Scotland will be happy with it and we are certainly happy with it."